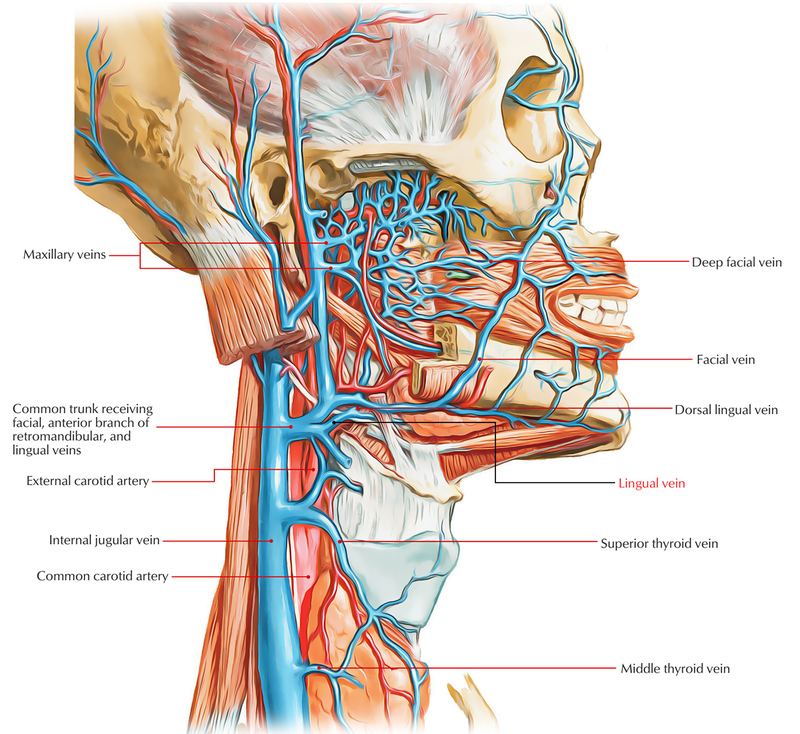 The lingual vein traverses external and internal carotid arteries in order to connect with the internal jugular vein and it is found just beneath and corresponding towards the hypoglossal nerve. Dorsal lingual and deep lingual veins drain the tongue. The deep lingual veins are detectable at the undersurface of the tongue via the mucosa. They divide from the arteries posteriorly through the hyoglossus muscles, although in anterior parts of the tongue, they travel along with the lingual arteries. On each side, the deep lingual vein travels on the external surface of the hyoglossus muscle with the hypoglossal nerve [XII] and through the aperture formed by the margins of the mylohyoid, superior constrictor, and middle constrictor muscles it goes out of the floor of the oral cavity. It connects with the internal jugular vein within the neck. The dorsal lingual vein goes along with the lingual artery in the middle of the hyoglossus and genioglossus muscles and similar to the deep lingual vein it empties into the internal jugular vein within the neck. Many drugs can be administered from sub-lingual route (below tongue) and in dosage form design & administration along with medicine, it is one of the most commonly used route of drug administration. Certain lipid soluble drugs can diffuse via the thin mucous membrane covering the sublingual region of oral cavity and can be absorbed into the circulatory system quickly. A primary example is nitroglycerin (Sorbitrate) which is a vasodilator (substance used for expanding size of blood vessels) used in cases of angina pectoris. The drug (tablet) is positioned beneath the tongue, where in less than 1 minute; it dissolves and travels through the thin oral mucosa into the lingual veins via diffusion.